A humpback whale was captured on camera jumping out of the ocean waters near California coast, in the US. It seems it was jumping out to high-five a sea gull! Now that is what we call One Whale of a Jump! The amazing picture was shot by German photographer Mario Nonaka on a trip around the bay, Caters News Agency reported. Marine scientists do not know yet if humpback whales leap out to get rid of germs and pests from their skin, or whether whales simply do it for fun. 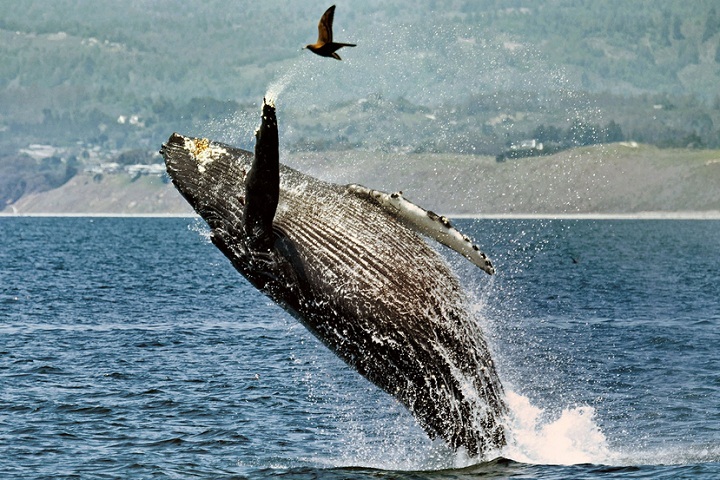 However, humpback whales are known to have very close relationship with marine birds. Did you know that humpback whales weigh about 40,000 kilos and are almost double the size of your school bus! And when they sleep they only shut one of their eyes while the other one remains open to watch out for predators. Quite so interesting!